Power: BPT PPC outfitted with Oyaide Rhodium outlets, Oyaide Rhodium outlet on wall. With a headphone amp, one of the most crucial design decisions is picking the volume control component. The manufacturer wants the purest and most transparent element within his proposed budget. Typically, the choice comes down to using a potentiometer or a stepped attenuator. Pots offer full analog control over output settings yet can suffer from tracking errors (especially at low volumes). In fact, tracking tolerance between channels can be as poor as a 20% variance, with the better examples such as those from Alps approaching 5%. Regardless of quality, all volume pots work the same way. It involves a contact wiper sliding along a strip or coil of resistive material such as carbon. The exact placement of the wiper along the carbon picks up a specific voltage somewhere between the values exhibited at the resistor ends. Stepped attenuators feature distinct and fixed levels wherein each step utilizes discrete resistors to creates a voltage divider network. This provides superior tracking to pots and is typically better sounding and longer lasting. However, with stepped attenuators, it can be tricky finding the desired volume since the difference between each click stop might be too large or too small. Some of the best stepped attenuators brands are DACT and GoldPoint. The PS Audio GCHA attempts to circumvent the signal degradation associated with traditional volume control approaches by utilizing gain cells instead. These devices allow the listener to alter the volume by adjusting the circuit's gain value rather than attenuating the full signal of the fixed gain as it is utilized in most headphone amps that feature pots or stepped attenuators as volume controls. The gain cells operate in completely analog fashion. A knob on the front panel raises or decreases the gain by increments of 0.001 dB over a range of -102dB at the lowest setting to +32dB at the highest. The gain cells feed its output into the power amplifier section of the GCHA, which utilizes a 5532 op-amp for the input and driver and a complimentary pair of bipolar transistors for the output stage. According to Paul McGowan, lead designer of PS Audio, the 5532 is "capable of great sound, with openness and dynamics when implemented correctly. The chip itself can drive headphones directly but will not perform well. It requires a pair of transistors in the feedback loop of the 5532 to sound good with warmth and dynamics." Paul also stated that the amp operates in Class A for "90% of what your listening to", with a flat frequency response up to 100kHz and distortion not kicking in until 10 watts of output power. The amp remains on whenever plugged in, its high idle current and bias setting producing a slight warmth to the touch, especially towards the back where the heart of the circuitry resides. When turned full counter-clockwise, the volume control clicks off which mutes the output. The heart of the PS Audio GCHA is its power supply. 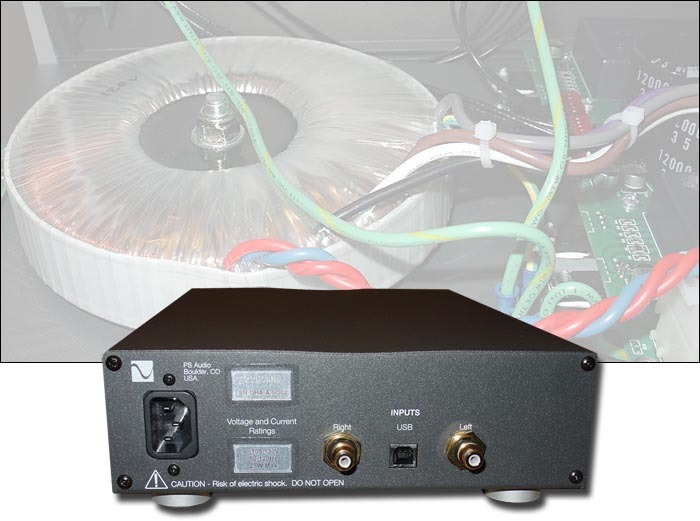 That features a big 50VA toroidal transformer which Paul states is about 10 times more than required because he always goes for overkill on transformers and power supplies, citing an experience he had with one of his early phonostage designs in which he substituted a much larger transformer for unexpectedly substantial improvements. From that point forward, he has always relied on oversized transformers for the job. Paul states that it is probably due to the lower resistance and output impedance of the larger transformers. The transformer here sits in the center of the chassis, takes up about 50% of the available real estate and makes up for about 90% of its hefty weight. From the transformer, the AC is regulated, rectified and filtered with a bank of capacitors, then fed to the gain cells. 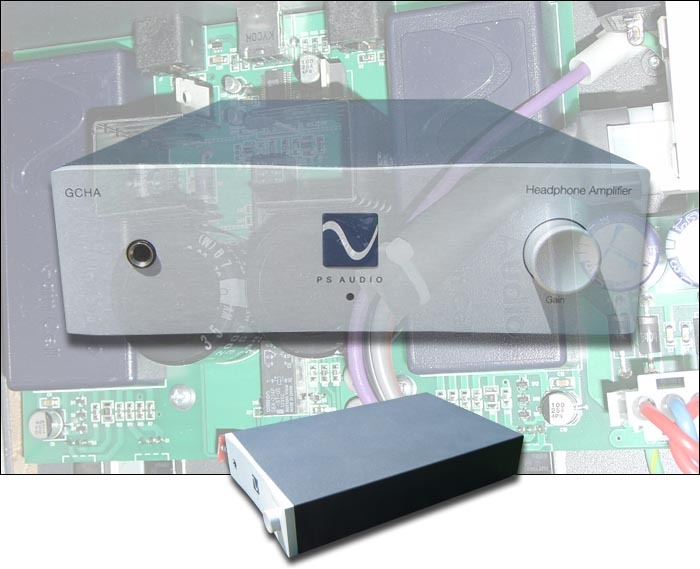 The GCHA also offers an internal DAC that can tapped from a USB input. The DAC is centered around the Burr-Brown 2702 chip, similar to the one used in Headroom's Bithead and Airhead and also implements a jitter-lowering device. I received a previously burned-in review unit, allowing me some valid impressions as soon as I plugged in. The first thing I noticed was how smooth the volume control operates. I could not perceive even the smallest increments other than that the volume increased and decreased in a completely gradual fashion. The inter-channel tracking at the lowest setting seemed perfect. I tested with my Grados, Sennheisers and the ultra-efficient Shure E5 ear monitors and none exhibited balance offsets as did all the other amps I have listened to. I listen at a relatively low level, a result of my still very sensitive hearing as well as to maintain my hearing for as long as I live due to my musical profession. If a recording is too hot or if a pot lacks quality, this channel imbalance can become quite annoying and cause a minor sense of disorientation after a few minutes. There were none of these issues with the GCHA. The Shure E5s with their 122dB/mW sensitivity direct-coupled to the ear canal are a true arbiter here. The channels were perfectly matched as soon as I turned the volume knob past its mute setting. What attracted me to reviewing the GCHA in the first place was a visit to a local HeadFi fanatic who owned the GCHA. I was listening with my HP-1000s when I noticed how clear and full-bodied the sound was at really low volumes. Most headphone amps require that you to raise the volume a bit to reach a full-bodied sound where bass body and weight, midrange presence, clarity in the highs, warmth, openness and dynamics start coming together. The GCHA exhibited this full-bodied sound as soon as I could start perceiving any signal, a great boon to my favored low volume listening. After spending three months and comparing it with my present headphone amp stable as well as gathering from acoustic memory all the headphone amps I have listened to over time, I can honestly say that the GCHA is the very best I have heard for low listening volumes. It has perfect tracking and channel balance even with the most sensitive headphones and maintains a full and clear sound that is consistent throughout the whole range of its output. I also pushed the amp to much higher volume settings than I normally would. As far as I could comfortably listen (which is actually quite high regardless of my preference for low volumes), the GCHA never sounded strained. It maintained clarity and sense of control and refinement that was never lost. It should also be noted that there was plenty of headroom to spare. I imagine most listeners would only ever use a fraction of the max 10 watt output the GCHA advertises. I have spent considerable time with the GCHA in a variety of system configurations and there are certain traits and sonic aspects that proved consistently present. The GCHA has a very liquid presentation that is devoid of added glare, hardness, hash or grain. Violins maintain their sweet tone without added grain overriding the sound. Saxophones maintain bite and force without being overtly forward, signifying the lack of any upper midrange glare, one of the causes for fatigue. I was able to listen to the GCHA for longer, more extended sessions at higher volumes if I chose to. The sound is cohesive from top to bottom. The bass, mids and highs integrate very well. This is highlighted with solo piano that covers the whole bandwidth of the instrument. I make sure to have my digital keyboard nearby when I am listening critically. If I hear something that sticks out or recedes by becoming muddy or congested within a certain passage, I quickly find it on the piano to pinpoint exactly where the nonlinearity occurs. On my reference piano discs, I could not detect any sense of discontinuity. Each note was clearly articulated and reproduced at its appropriate dynamic level. I had the sensation of these piano solos as complete entities rather than individual notes strung together. This cohesiveness across the spectrum transferred naturally to all other instruments. One of the hardest aspects to recreate on headphones is the sense of soundstage. On speakers, the two sound sources in front of you are each heard by both ears, with the farther speaker slightly reduced in output to the one closer to the ear. This acoustic cross-feed allows our brain to localize sonic events easily. Headphone usage negates these aspects of stereophonic sound reproduction. The transducers are directly coupled against the ears and each ear only receives the signal coming from its specific left or right source. For a lot of listeners -- especially those accustomed to the stereo mirage cast by speakers -- headphone sound can be flat and 2-dimensional, with the overall image appearing to be two blobs stuck inside the cranium. Yet many listeners report that they do indeed hear and experience the sense of soundstage with headphones as well and are able to enjoy a sense of depth, layering, image placement and ambient air surrounding the performers within this imaginary landscape of sound that appears in front of and around the listener. I believe a lot of that ability to hear headphonic soundstage is somewhat dependent upon how much headphone listening experience the user has. As I've clocked more time with headphones, the sound appeared to blossom outwards, images appeared to be more clearly focused and a general sense of comfort and ease developed. I deduce from my own personal experience that the brain adapts to the sonic presentation of headphones and becomes more adept at tricking the listeners into actually perceiving sound in front and around them to create the illusion of soundstage. However, I also noticed that as time went on and my listening experience grew, the perceived differences of soundstage reproduction between various components became more pronounced. Higher quality components did a better job of creating that illusionary soundscape than inferior components. Compared to the GCHA's soundstaging, the Emmeline HR-2 is right on par while the HeadAmp GS-1 is quite compressed along the axis in front of the listener. The Headroom Desktop with cross-feed engaged matched the depth of the GCHA's soundstage but the Headroom lacked that last bit of openness and air around the performers that the GCHA so effortlessly exhibited. However, I still don't think that even the best solid-state can reach the level of soundstage transparency a well-designed tube unit can. For the longest time, the Emmeline II Raptor with Sennheiser HD650s offered the most realistic soundstage I have heard from a dynamic rig. However the EddieCurrent EC-01 recently reviewed may soon take that coveted title chez Ryan's. It has proven itself to sound truly remarkable, with an incredible life-like presentation that captures cubits of spatial and ambient information. Despite the superiority of its tubed brethren, the GCHA offered an airy, enveloping soundstage with wonderful depth. PS Audio advertises that its Gain Cell technology allows the listener "Pure Resolution" and its marketing implies that the gain cells offer volume control without conventional attenuation, keeping the signal pure and free from degradation. My listening impressions cannot substantiate that claim. I did not find the GCHA to be any more resolving of inner detail, dynamic nuance or sonic transparency than the other amps it was compared against and which use pots and stepped attenuators instead. That is not to say it wasn't highly resolving and transparent. It was. Yet over 3 months of dedicated listening, I cannot claim it to be more resolving and transparent than good amps with pots or stepped attenuators. I did not hear any new details. There were no micro details that suddenly popped out of nowhere. There was no profound realization of a newly discovered instrumental color coming from a familiar disc. As I write this review, I cannot say that the GCHA revealed anything that I did not already know about my system's components and their ability to convey music. I noted above that the presentation was smooth, liquid and relatively laid back. I found this to be consistent with all my recordings, regardless of their quality. Even when hooked up to my computer playing 192kbps MP3s through the internal DAC, the sound remained the same - smooth, liquid and laid back. This made for an enjoyable and pleasant listen on practically everything I owned. The presentation proved utterly fatigue-free and I could listen for hours on end. However, the PS Audio piece didn't highlight differences between recordings I knew were present. Another sonic issue I had with the GCHA was in the realm of dynamics. It was quite reserved in that it never really expanded into the bombastic fury of fortissimos or the hushed intensity of pianissimos I'm used to. The dynamics were contained within a shrunk window that encompassed mezzo piano to mezzo forte, essentially medium soft to medium loud. The amp was a bit polite and reserved in this regard. This works very well with rock recordings where monotonous forte is the name of the game but with more complex orchestral recordings, dynamic nuance becomes very important to capture the essence and emotional impact of the performance. Wagner should bring the roof down. Beethoven should have me crying one minute and praising the heavens above in ecstasy the next minute. Even the Pixies should be able to play with my emotions with their contrasting dynamic shifts. The GCHA had a hard time capturing these dynamic impacts. Where the GCHA wins is with depth of soundstage, air and ambiance, smoothness and liquidity across the whole spectrum - and sonic consistency across the entire volume range down to the most infinitesimal. On top of that, the GCHA seemed to share a myriad of positive sonic traits with every other amp I have listened too. It matched the focus, precision and clarity of the HeadAmp GS-1. The GCHA offered the same level of texture, timbral refinement and drive as the Emmeline HR-2. Its bass depth was similar to the Headroom while its spaciousness was only slightly bested by the Emmeline Raptor and EddieCurrent EC-01. The midrange offered the kind of warmth and sweetness that any audio device should possess. The GCHA does so much so well that it should be considered by any dedicated headphone listener looking for amps in its price range. While not groundbreaking or revolutionary in my book, the GCHA is highly transparent and resolving. Dynamics are a bit bland compared to other headphone amps, but its smooth laid-back presentation lends itself well to listeners looking for an amp that will offer hours of unimpeded listening enjoyment without the need for rest. The ability to listen at low volumes is a definite and unusual plus in my book. The internal DAC hooks up through a USB port, allowing it to become the cornerstone of a simple computer-based rig that offers tight and grainless sound. At its $995 price tag, the GCHA offers many sonic virtues while compromising very little.